Today’s beef consumers have more options than ever before. Beef isn’t just the protein of choice saved for special occasions, like Grandma’s Sunday pot roast or a fancy T-bone grilled especially for you on your birthday or anniversary, it has become an everyday staple in American diets. Beef consumers now have access to more specialty cuts and a plethora of information and education about how to choose, prepare and serve beef, thanks to the funding and research from the Beef Check-off. And, with so much information readily available, consumers want to know more about how their beef was treated and raised when it was still on hoof. Cattle producers genuinely care about the cattle they raise for food. They are feeding consumers globally, along with their own families those same beef products. However, with the advent of so many value-added marketing programs, producers are taking the extra effort to ensure their cattle stay even healthier through sale time to guarantee they qualify for as many premiums as possible. Superior Livestock is the leader in value-added programs and has been since the mid-1990s when the marketing company introduced its first VAC program. Now, nearly every producer vaccinates his or her cattle to make sure they stay healthy and don’t require further treatment. As a result, Superior has introduced even more programs to provide opportunities to those progressive operators who want to provide cattle that the consumer prefers like non-hormone treated cattle, natural and GAP cattle. Jason Barber, Purebred Division Manager at Superior Livestock, said GAP cattle are those in the Global Animal Partnership, and the ranches that participate are qualified prior to marketing time. Whole Foods ultimately purchases those cattle, and Barber predicts their demand will increase. Not only is the demand for GAP-enrolled cattle increasing, but the demand for all program cattle is growing. “There has been a really high demand for all program cattle. At our Bellringer Sale in January in Denver, program cattle earned a range from $13 to 16/cwt premium. With those types of premiums, a lot more people are being proactive and putting more effort forth to capture that premium,” Barber said. One way to be sure those premiums are met are to keep cattle healthy from their early stages of production to avoid the chance they might need an antibiotic to treat sickness. Although antibiotics are not harmful to the meat due to proper withdrawal times, their use typically eliminates those cattle from remaining in any natural programs that do offer premiums. 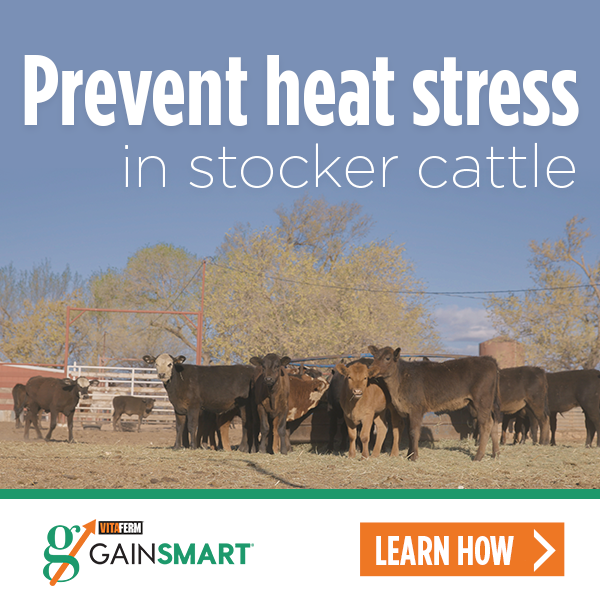 Therefore, keeping cattle well hydrated, on a good plane of nutrition and on a high-quality mineral program like VitaFerm® Gain Smart® will typically help keep them healthy and in those programs. Gain Smart is a high-quality vitamin and mineral supplement specially designed for stockers and backgrounders. The highly fortified supplement comes with the Amaferm® advantage, to ensure that the calves are receiving the absolutely best intake, digestibility and absorption all while maintaining optimum health and performance. Amaferm is a precision-based prebiotic designed to enhance digestibility by amplifying the nutrient supply within for maximum performance, and it is research-proven to increase intake, digestibility and absorption. “The use of an antibiotic can knock the premiums out in a hurry on cattle targeted for these higher-level natural programs. So, if you can be proactive with a good nutrition program and eliminate needing to doctor a calf with an antibiotic, it pays on sale day. We know those premiums are well above market, and we know that Gain Smart is really effective, and it keeps a higher percentage of those cattle in these programs for sure,” Barber said. In addition to keeping cattle in various natural programs, there is also a value-added program specifically for Gain Smart fed cattle. The VitaFerm Gain Smart and the VitaFerm Raised (calves raised on cows being fed a VitaFerm mineral) programs are the first two nutrition programs that Superior recognized in its line-up of value-added programs. Not only have producers seen value in those programs, they have experienced the value by keeping their cattle healthy and keeping them in other programs. Consumers know they have choices. As a producer you have a choice too. Give the producer a tasty, wholesome product and you will be rewarded with premiums.